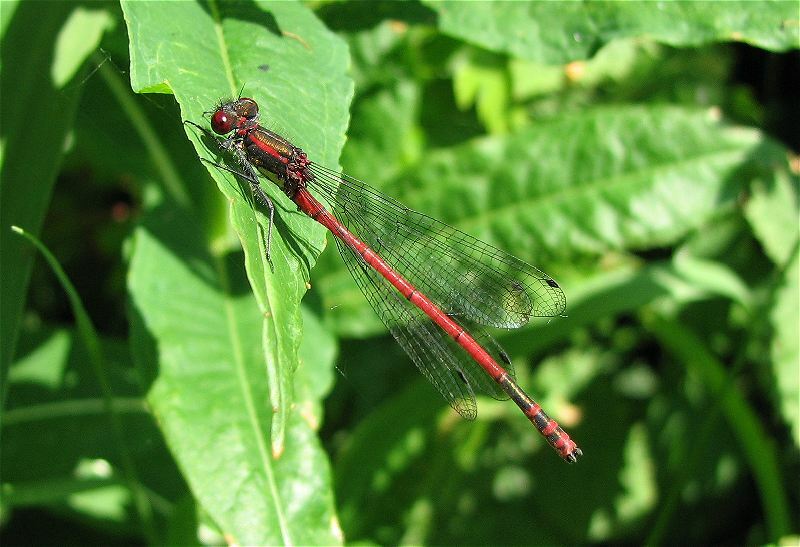 The only red damselfly in Yorkshire and unlikely to be mistaken for anything else. Red abdomen, with black bands on segments 7 to 9. Thorax is black on the top with a red stripe (yellow in immatures). Black areas have a bronze tint. Occurs in three colour forms. The commonest form is typica, with black bands on most segments of the abdomen. Fulvipes is less well marked than typica and closely resembles the male. Melanotum is a dark from being mainly black, however the antehumeral stripes remain yellow (only yellow when immature in other forms). 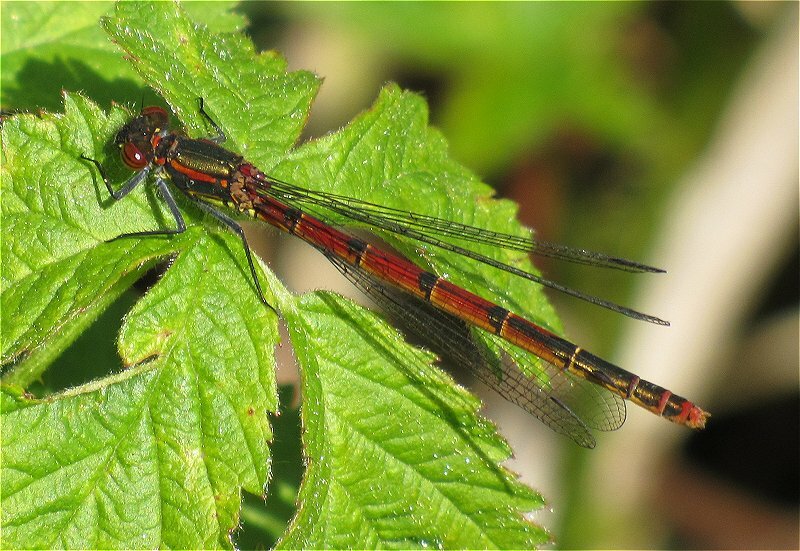 This is the first damselfly to emerge each year in Yorkshire. It has a synchronous emergence, all emerging within a three week period, it is therefore shortly after emergence that this species is most abundant. Males emerge slightly earlier than females and also mature more quickly. Copulation lasts for around 15-20 minutes. Eggs are laid in tandem, the female may submerge taking the male with her. The life cycle is two years, on initially occupying a new site there may therefore only be adults found every other year. Has a wide habitat tolerance, including brackish and slightly polluted water, though avoids fast flowing water. 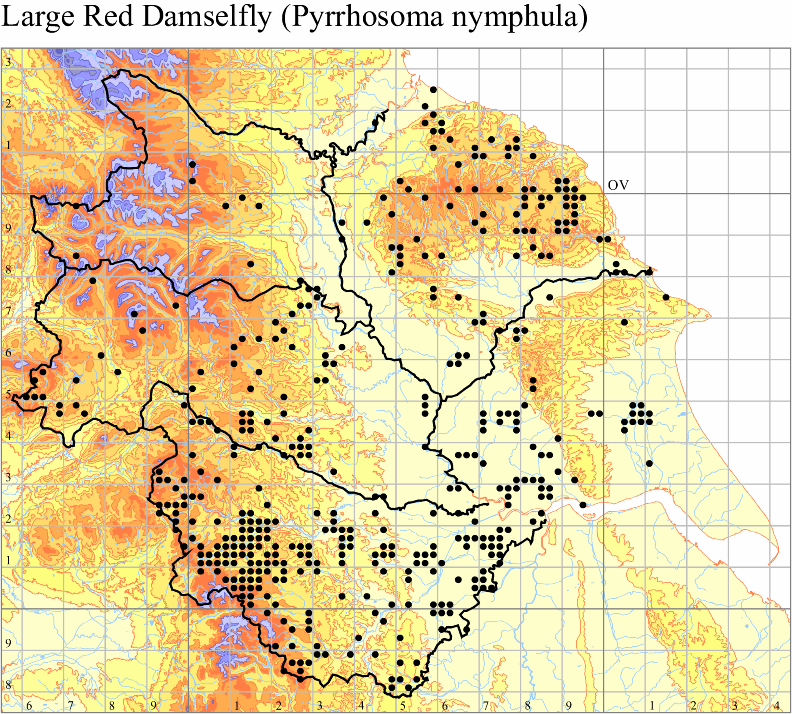 Higher abundance in well vegetated, standing water. National: Mid April to early September. Yorkshire: Mid April to late July. Evenly distributed across VC61-64, scarce in VC65.